Pics: Tweeps Take It Upon Themselves To Fix Lasizwe’s Outfit. If your outfit for the day is horrible, don’t despair, Twitter will fix it for you. This has been the case with Lasizwe. The child star definitely stood out at the E! Africa 15th Anniversary. He wore a body suit with nothing but a blazer on top. 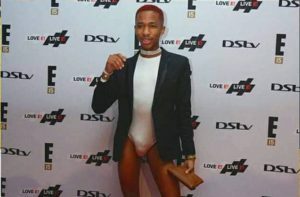 Lasizwe who shared d a few pictures of his look said the outfit was inspired by Rich Mnisi. Twitter tore him apart with some calling him a baby on a romper. Lasizwe seems unfazed though by all the negativity, and rather shared a powerful tweet about his character. “I want to get more comfortable being uncomfortable. I want to get more confident being uncertain. I don’t want to shrink back just because something isn’t easy. I want to push back, and make more room in the area between I can’t and I can. Indeed he is one of a kind. He even retweeted the images in which he was mocked for his daring look. Check out some of them below.